Department of Biochemistry, Faculty of Medicine, Benha University, Egypt. Background: Reactive Oxygen Species (ROS) production has been established as an essential contributor in the development cardiotoxicity. The increase of ROS production simultaneously leads to the inhibition of anti-oxidant systems. Forkhead transcription factor O1 (FOXO1) plays an important role in regulating metabolism and oxidant stress. Clozapine was used to induce cardiotoxicity. Forskolin the well-known anti-oxidant and anti-inflammatory agent was used to modulate the effect on both FOXO1 gene and its target gene catalase and to what extent it may protect against clozapine-induced cardiotoxicity. Methods: The animals were classified into: control group, forskolin group; forskolin was administered for 8 weeks; clozapine group, and forskolin + clozapine group; forskolin was pre-administered for 5 weeks then continued along with clozapine for the last 3 weeks. RT-qPCR and gel electrophoresis were done. We analyzed the relation between FoxO1 gene and oxidative stress. Results: These effects are achieved by the ability of Forskolin to modulate the expression of Foxo-1 and catalase, the levels of CKMB, troponin I, GST, MDA, and TNF- α, Caspase-3 were decreased, histopathological changes were improved. Forskolin reduce cardiomyocytes damage, and improve cardiac function by decreasing oxidative stress. Conclusion: Forkolin with its biological activities and anti-oxidative effects control cardiotoxicity induced by ROS in addition to its anti-inflammatory activity. This may be considered as therapy in cardiac problems management. Forskolin (FSK) is a labdane diterpene contains some unique functional elements, including the presence of a tetrahydropyranderived heterocyclic ring, it is commonly to raise levels of cyclic AMP (cAMP) in the study and research of cell physiology. FSK activates the adenyl cyclase and increases intracellular levels of cyclic AMP (cAMP) . cAMP is an important second messenger necessary for the proper biological response of cells to hormones and other extracellular signals in cell communication . Forehead box, class O1 ( FOXO1) is one of transcription family factor. It is conserved as a DNA binding domains subjected to posttranslational modification. Such modifications can increase or decrease the transcriptional activity of FOXO1 and play important role in oxidative stress and regulating cellular metabolism . FOXO1 transcription factors regulate the expression of genes that coding for antioxidant activities . The mitochondria are a major source of Reactive Oxygen Species (ROS) production in organs with high metabolic activity, as in the heart . The increase of ROS production simultaneously leads to depletion of the anti-oxidant systems and Electron Transport Chain (ETC) complex that leads to increase ROS levels . ROS modulate FOXO activity at posttranslational levels, and also regulate FOXO antioxidant activity, also it affect FOXO subcellular localization, activity as transcription factor , FOXO target genes can classified into stress response, anti-oxidative defense, cellular metabolism, and cell death and proliferation . Catalase is an endogenous antioxidant enzyme, any alteration in function of catalase affect the protection against oxidative stress . For unknown reason there is low catalase activity in the heart that responsible for the high sensitivity of this organ to oxidative stress . Under conditions of hypoxia and ischemia, transcription factors interact with FOXO1 and to enhance their transcriptional function . Clozapine (CLOZ) is an atypical antipsychotics tricyclic benzodiazepine derivative, it appears to be particularly beneficial in patients with schizophrenia mainly who are unresponsive or intolerant to other typical antipsychotics . In spite of high clozapine efficacy, its clinical use has been limited due to its cardiotoxicity . The mechanisms underlying the development of CLOZ-induced cardiotoxicity are complex and not fully understood. Previous studies showed increased release of inflammatory cytokines . Many reports have shown an increase in the level of Reactive Oxygen Species (ROS) . Also, CLOZ treatment has been associated with increased levels of the catecholamines, norepinephrine and epinephrine. Hyper-catecholaminergic states can significantly exacerbate myocarditis in both animals and patients . Our study aims to investigate the possible prophylactic effects of forskolin pretreatment against clozapineinduced cardiotoxicity in rats. The objective of present study was to determine the effect of FSK on FOXO1 expression by RT-qPCR and the relationship of FOXO1 activation to oxidative stress. Thirty two adult male albino rats (at 10–12 weeks old) weighing 220-250 g were used in this study after 7 days of acclimatization. The animals were obtained from Helwan farm (Holding Company for Biological Products and Vaccines; VACSERA, Giza, Egypt). The rats were kept under 12:12 h light-dark cycle and were given standard laboratory diet and water. Dealing with animals and experimental procedures were done with respect to the roles of the US national institute of health on use and care of experimental animals. The experimental protocol was approved by the Animal Research Ethics Committee of the Faculty of Medicine, Benha University, Egypt. Forskolin and clozapine powder were obtained from Sigma- Aldrich Chemical Co. (St Louis, Missouri, USA). All drugs were dissolved in distilled water and were freshly prepared before use. Group 1: Control group received distilled water orally for 8 weeks without any drugs. Group 2: FSK treated group: received 6 mg/ kg/day of forskolin, orally, for 8 weeks  Group 3: CLOZ treated group: received 25 mg/kg/day of clozapine, i.p. for 3 weeks . Group 4: FSK + CLOZ treated group: received 6 mg/kg per day of forskolin orally for 8 weeks  combined with 25 mg/kg/day of clozapine, i.p. for the last 3 weeks . At the end of the experiment a midline abdominal incision was performed and blood was collected from abdominal aorta and the serum was immediately separated by centrifugation in a refrigerated centrifuge (4°C) at 3000 rpm for 20 minutes. Then serum rapidly frozen and stored in liquid nitrogen (−80°C) for measurement of oxidative stress markers and expression of FOXO1 and catalase by RT- PCR. The hearts were collected and dissected into two longitudinal halves; the first one was placed into formalin 10% for histopathological. About 100 mg of heart tissue were homogenized in 2 mL of an ice-cold buffer composed of 50 mmol/L potassium phosphates, 1 mmol/L EDTA, pH 7.5, using a mortar and pestle. The homogenate was then centrifuged for 15 min at 4°C, and the resultant supernatant was kept at -20°C until analysis. The biochemical antioxidant marker manoaldehyde (MDA), gluthathiones transferase (GST), Caspase-3 and Tumor Necrosis Factor (TNF) alpha were measured using a colorimetric method according to the manufacturer’s instructions (Bio diagnostics, Dokki, Giza, Egypt). Total RNA was extracted from serum by using RNA Mini Kit (Qiagen, USA) according to manufacturer’s instruction where the quantity and quality of RNA were evaluated by Nano drop (USA). Ratio of readings at 260 nm and 280 nm (A260/280) provide an estimate of purity of RNA pure RNA had A 280/260 ratio of 1.9-2.3(OD260/ OD280). RNA (5 μg) was then reversed transcribed using revert aid TM first strand cDNA synthesis kit (Ferments life science, USA) then cDNA was subsequently amplified with the Syber Green PCR Master Kit (Applied Biosystems, USA) in a 48-well plate, PCR was performed in a 30 μ reaction volume containing 5 μl lcDNA, 2.5 μl forward primers, 2.5 μl reverse primers, sequences were designed as follows: FOXO1 gene: forward GCCGTGCTACTCGTTTGC and reverse CTTGGGTCAGGCGGTTC; catalase, forward TATTGCCGTCCGATTCTC and reverse ATGCCCTGG TCAGTCTTG, and GAPDH was used as an internal control and the primer sequence was: forward CAGTGCCAGCCTCGTCTCAT and reverse AGGGGCCATCCACAGTCT TC.5 μl of DNA polymerase, 7.5 μ syber green and 7.5 μ buffer. PCR amplification conditions were done in one step real time PCR instrument (Applied Bio systems, USA) as follows: initial denaturation at 94°C for 5 min, followed by 30 s at 94°C, 35 s at 54°C, and 2 min at 72°C for a total of 35 cycles and a terminal extension at 72°C for 10 min [17,18]. Relative quantification of FOXO1 and catalase performed with the 2-ddCt method, and analyzed by ABI prism 7500 the Boxplot software and values were normalized to the quantity of GAPDH. After amplification, 5 μl of PCR products were resolved on a 2% agarose gels, and DNA bands were visualized by UV light in FoxO1 and catalase genes. The collected data were tabulated and analyzed using SPSS version 16 software (SPSS Inc, Chicago, ILL Company) data were expressed as mean ± standard deviation and range. Data were tested for normality using Shapiro-Wilks test, assuming normality at P>0.05. Differences between groups were rested using ANOVA test for normally distributed variables or Kruskal Wallis test for non-parametric variables. Significant ANOVA or Kruskal Wallis were followed by post hoc multiple comparisons using Bonferroni test to detect the significant pairs. ROC curve analysis was used to detect cutoff values of the studied genes with optimum sensitivity and specificity in prediction of cardio, hepatotoxicity. The accepted level of significance in this work was stated at 0.05 (P<0.05 was considered significant). To explore the effect of FSK on cardiotoxicity, FOXO transcription factors play a role in the response to oxidative stress. We investigate the change of oxidative stress and determine the relationship between FoxO1 and oxidative stress in cardiotoxic rats. Therefore, we examined the expression of FoxO1 and effect of FoxO1 on catalase expression in cardiotoxic rats. RT-qPCR and gel electrophoresis was performed to detect fox and catalase genes expression, FSK ameliorate cardiac pathological changes. Table 1 There is a significant increase in FoxO1 gene expression p<0.001 in CLOZ+FSK group while in clozpen group there is a significant decrease in Fox gene expression p<0.001. Administration of FSK showed non-significant changes FoxO1 expresssion compared to control rats. Table 1: FSK effect on FoxO1 expression. Table 2 Oxidative stress in cardiotoxic rats with or without FSK, there is a significant increase in serum Troponin I, CK-MB and cardiac Caspase -3, TNF alpha, MDA, GST p<0.001 with clozapen. While there is a significant decrease in serum troponin I, CK-MB and cardiac Caspase- 3, TNF alpha, MDA, GST with clozapen +FSK p<0.001, Administration of FSK showed non-significant changes FoxO1 expresssion compared to control rats. From that indicate cardioprotective effect of FSK Rho test was used. Table 2: Showing changes in biochemical indicators (oxidative markers). Table 3 showed that FoxO1 activity in cardiotoxicity. Decrease in the generation of MDA, changes GST, caspase, TNF, troponin and CK-MB) concomitant Increase FoxO1 activity, decrease oxidative stress, FSK activate FoxO1 that act as antioxidant through improvement of oxidative stress p value <0.001. Table 3: Foxo1 gene expression in response to oxidative stress. 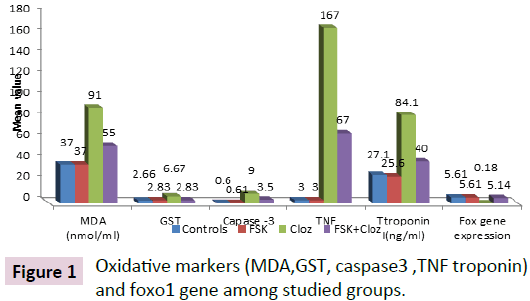 Figure 1: Oxidative markers (MDA,GST, caspase3 ,TNF troponin) and foxo1 gene among studied groups. Administration of FSK showed non-significant changes in biochemical indicators and FoxO1 expresssion compared to control rats. Figure 2 showed that administration of FSK+ clozapen cause significant decrease in serum CK-MB when compared to CLOZ group. p value <0.001, Administration of FSK showed nonsignificant change in CK-MB compared to control rats. 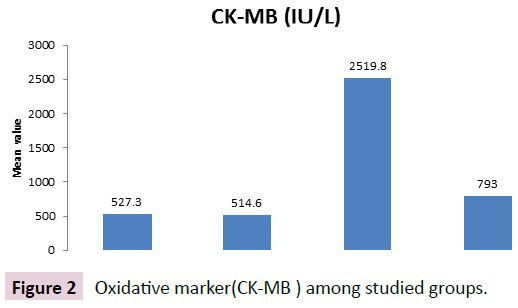 Figure 2: Oxidative marker(CK-MB ) among studied groups. 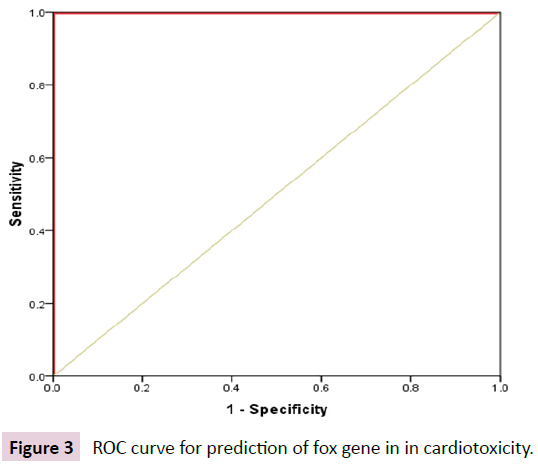 Figure 3 showed the ROC curve for prediction of fox gene in in cardiotoxicity (Table 4). Figure 3: ROC curve for prediction of fox gene in in cardiotoxicity. Table 4: ROC curve for the performance of fox gene in prediction of cardiotoxicity. Heart tissue specimens were fixed in 10% neutral buffered formalin, embedded in paraffin, and then cut in sequential sections of 4–5 mm thickness. These sections were stained with routine H&E (Figure 4a-d). 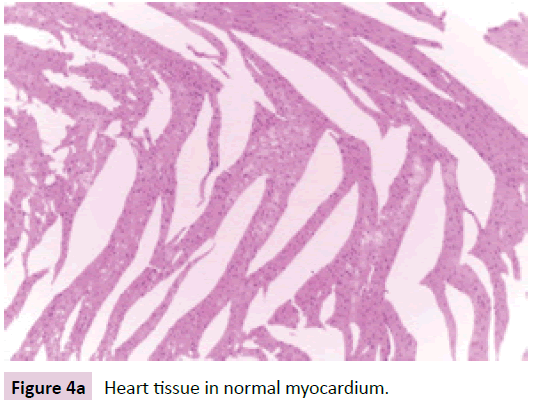 Figure 4a: Heart tissue in normal myocardium. 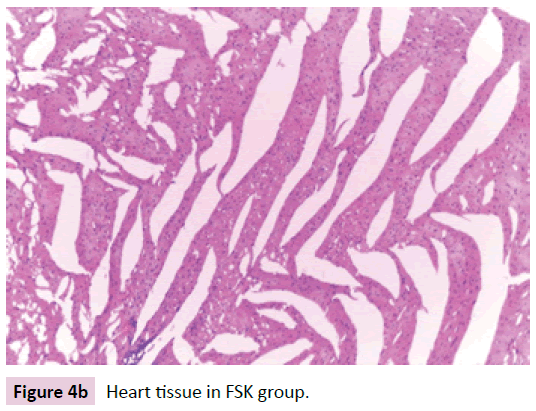 Figure 4b: Heart tissue in FSK group. 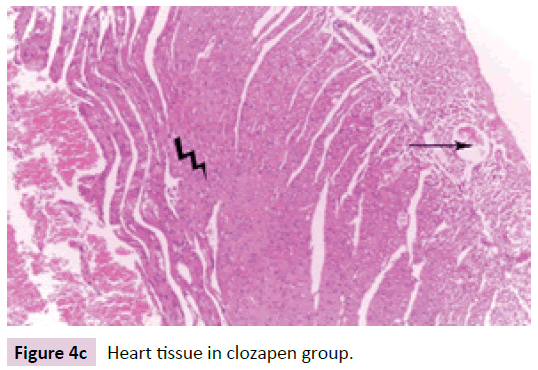 Figure 4c: Heart tissue in clozapen group. 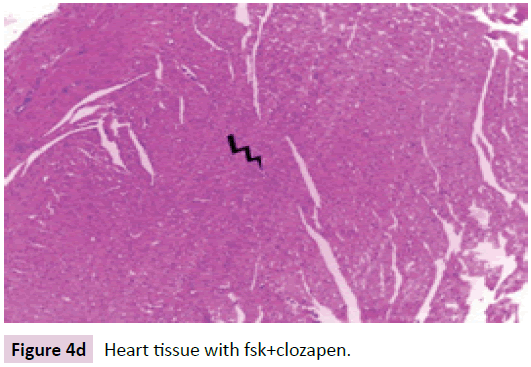 Figure 4d: Heart tissue with fsk+clozapen. Figure 5a shows the gel electrophoresis of amplified products of FoxO1 gene in cardiotoxic group shows that the relative amounts of FoxO1 mRNA were higher in cardiotoxic rats treated with FSK compared to cardiotoxic rats without treatment that showed that the expression of FoxO1 mRNA was statistically increased. Figure 5a: Gel electrophoresis of amplified products of foxo1 genes. Figure 5b: Gel electrophoresis of amplified products of catalase gene. Figure 5b shows the gel electrophoresis of amplified products of catalase gene in cardiotoxic group shows that the relative amounts of catalase mRNA were higher in cardiotoxic rats treated with FSK compared to cardiotoxic rats without treatment that showed that the expression of catalase mRNA was statistically increased. Myocardial cell injury can lead to release of ROS . Cell injury in the ischemic area also causes infiltration of neutrophils, which produce more ROS and cytokines as tumor necrosis factor-α (TNF-α) which trigger mitochondrial release of more ROS with a relative deficit in the endogenous antioxidant defenses can cause myocarditis, contractile dysfunction and cardiomyopathy, clozapine-induced myocarditis has been associated with an increased release of inflammatory cytokines . The released free radicals and ROS can attack membrane phospholipids, increasing lipid peroxidation and damage to the myocardial cell membrane  this process is reflected as elevated MDA and GST levels . In the present study induction of cardiotoxicity by clozapine led to marked down regulation of both FoxO1 and catalase genes as well as aggressive increase in CKMB, troponine I, GST, MDA, TNF- α, Caspase-3 levels and histopathological abnormalities. In the current work Forskolin modulated FoxO1 transcription factors and its cellular response to oxidative stress Also, the levels of CKMB, troponine I, GST, MDA, TNF- α, Caspase-3 were decreased, histopathological changes were improved. Transcription factors of the fork head box, class O (FoxO) family are important regulators of the cellular stress response and act as cellular antioxidant defense . The fork head-type transcription factors control expression of antioxidant genes such as catalase  The interaction between FoxOs and co-regulators and antioxidant prove redox sensitive regulation of FoxO gene expression The production of Reactive oxygen (ROS) is dependent on the expression and activity of anti-oxidant enzymes . FOXO1 act as tumor suppressive. Through the activation of proapoptotic proteins and caspases, also FoxO1 exert inflammatory effect through interaction with receptors . In this study, the expression of FoxO1 mRNA was down regulated in cardiotoxic group concomitant with CAT mRNA expression, also FoxO1 mRNA expression upregulation concomitant with an upregulation with CAT mRNA expression these results in agreement with previous results [25,26]. This explained by oxidative stress mediated cardiac injury and production of ROS CAT normally represents the first line of cell defense against oxidative stress-mediated cardiac injury . Clozapine reduced the antioxidant activity in the heart and this depletion in antioxidant defense mechanism that was associated with the elevation of CAT activity, FoxO is a critical transcription factor for the anti-oxidative stress response and it activates genes related to redox. Our results suggested that FSK protect heart from oxidative stress, under stressful conditions, the high level of ROS inhibit phosphorylation and acetylation of FoxO protein and enhancing Fox DNA binding activity thus FoxO control ROS by transcription regulation. This indicate that FoxO protect cell from oxidative stress by upregulating anti-oxidant gens like (CAT) the down regulation of CAT mRNA in cardiotoxic rats suggested that ROS/FOXO pathway was dysfunction . The balance between enzymatic and non-enzymatic mechanisms control production of ROS and transform ROS into non-toxic molecules in myocardium Antioxidant enzymes are activated during oxidative stress and also after activation of cytokines . Catalase is endogenous antioxidant enzyme, functions in detoxification of free radicals in the myocardium any alteration in function of catalase affect the myocardial protection against oxidative stress . Foxo-1 gene or its target gene catalase act as antioxidant enzymes that affect the intra- and extracellular redox state by catalyzing dismutation and reduction of ROS , the conversion of ROS to oxygen and water require presence of catalase and low catalase activity in the heart, however this organ is very sensitive to catalase. The presence of catalase is considered as cardio protection against oxidative injuries that leads to apoptotic cell death or arrest cell cycle. FoxO1a and FoxO3a enhance cardiomyocyte cell survival during exposure to oxidative stress that leads to combined deletion of FoxO1a and FoxO3 and increase in infarct area and decreased expression of anti-apoptotic molecules, antioxidant enzymes and apoptosis , thus role of FoxO in oxidative stress act as prosurvival and pro-apoptotic. Downregulation of FoxO1 expression correlating with the increase in oxidative marker (MDA,GST,TNF) in cardiotoxic group, these markers increased in the group receiving clozapine at 12-week. Pretreatment with forskolin decreased the oxidative markers significantly compared to non-treated rats these results are in agreement  with These results suggest that FSK decreases oxidative stress and improve the heart injury  indirect increase in the anti-oxidant capacity by modulating genes expression and by inducing the endogenous anti-oxidant enzymatic defense system  may increase the expression of FoxO1, which increases its antioxidant target genes (CAT) to reduce ROS level in the heart . These data are in line with  that reported that forskolin has antioxidant properties, inhibits the production of ROS and thereby, prevents the fragmentation of DNA and ultimately reduced cell necrosis. Our results are also in agreement with the previous studies which have shown that forskolin have an anti-inflammatory effects by an antagonistic effect on TNF alpha, and its reduction of the levels of interleukins 1β, 6, and 8 . Another study showed that forskolin affected oxidative stress which interacts in several cardiovascular and metabolic pathologies . In conclusion the produced beneficial effect of forskoline in protection against cardiotoxicity due to its ability to increase FOX gene expression, which increases its antioxidant target genes CAT to reduce ROS level and may regulate cell survival and/ or apoptosis well as its anti-oxidant, anti-inflammatory and antiapoptotic properties. This may open a new therapeutic window for cardiac patients. We gratefully thank the technical and administrative staff at the departments of pharmacology, biochemistry and pathology, Faculty of Medicine, Benha University for their assistance and support. Sapio L, Gallo, MIlliano M, Chiosi E, Naviglio D, et al. (2017) The Natural cAMP Elevating Compound Forskolin in Cancer Therapy. Is It Time? J cell Physiol 232: 922-927. Alasbahi RH, Melzig MF (2012) Forskolin and derivatives as tools for studying the role of cAMP. Die Pharmazie 67: 5-13. Daitoku H, Fukamizu A (2007) FOXO transcription factors in the Regulation of FoxO transcription factors by acetylation and protein-protein interactions. Biochim Biophys Acta 1813: 1954-1960. Malik AI, Storey KB (2011) Transcriptional regulation of antioxidant enzymes by FoxO1 under dehydration stress. Gene 485: 114-119. Granger DN, Kvietys PR (2015) Reperfusion injury and reactive oxygen species: The evolution of a concept. Redox Biol 6: 524-551. Zhao Y, Wang Y, Zhu WG (2011) Applications of post-translational modifications of FoxO family proteins in biological functions. J Mol Cell Biol 3: 276-282. Calnan DR, Brunet A (2008) The FoxO code. Oncogene 27: 2276-2288. Zhang Y, Zhang L, Sun D, Li Z, Wang L, et al. (2011) Genetic polymorphisms of superoxide dismutase, catalase, and glutathione peroxidase in age-related cataract. Mol Vis. Kang YJ, Chen Y, Epstein PN (1996) Suppression of Doxorubicin Cardiotoxicity by Overexpression of Catalase in the Heart of Transgenic Mice. J Biol Chem 271: 12610-12616. Stone JR, Yang S (2006) Hydrogen peroxide: a signaling messenger, Antioxidant. Redox Signal 8: 243-270. Siskind D, McCartney L, Goldschlager R, Kisely S (2016) Clozapine v, first- and second-generation antipsychotics in treatment-refractory schizophrenia: systematic review and meta-analysis. The British journal of psychiatry. J Mental Sci 209: 385-392. Midbari Y, Ebert T, Kosov I, Kotler M, Weizman A, et al. (2013) Hematological and cardiometabolic safety of clozapine in the treatment of very early onset schizophrenia: a retrospective chart review. J Child Adolesc Psychopharmacol 23: 516-521. Abdel-Wahab BA, Metwally ME (2014) Clozapine-induced cardiotoxicity in rats: involvement of tumour necrosis factor alpha, NF-κB and caspase-3. Toxicol Rep 1: 1213–1223. Mishra P, Samanta L (2012) Oxidative stress and heart failure in altered thyroid states. Sci World J.
Wang JF, Min JY, Hampton TG (2008) Clozapine-induced myocarditis: role of catecholamines in a murine model. Eur J Pharmacol 592: 123-127. Ríos-Silva M, Trujillo X, Trujillo-Hernández B, Sánchez-Pastor E, Urzúa Z, et al. Effect of chronic administration of forskolin on glycemia and oxidative stress in rats with and without experimental diabetesInt. J Med Sci 11: 448-452. Wu L, Zhang Y, Ma X, Zhang N, Qin G (2012) The effect of resveratrol on FoxO1 expression in kidneys of diabetic nephropathy rats. Mol Biol Rep 39: 9085-9093. Mortuza R, Chen S, Feng B, Sen S, Chakrabarti S (2013) High glucose induced alteration of SIRTs in endothelial cells causes rapid aging in a p300 and FOXO regulated pathway. 8: e54514. Yin H, Xu L, Porter NA (2011) Free radical lipid peroxidation: mechanisms and analysis. Chem Rev 11: 5944-5972. Panda P, Mokta J, Mokta K (2014) Catecholamine induced cardiomyopathy in phaeochromocytoma. Indian J Endocrinol Metab 18: 432. Lars-Oliver K, Sánchez-Ramos C, Prieto-Arroyo I, PavelUrbánek, Steinbrenner H, et al. Redox regulation of FoxO transcription factors Redox Biology 6: 15-72. Zhou S, Sun W, Zhang Z, Zheng Y (2014) The role of Nrf2-mediated pathway in cardiac remodeling and heart failure. Oxid Med Cell Longev. Stahl M, Dijkers PF, Kops GJ (2002) The forkhead transcription factor FoxO regulates transcription of p27Kip1 and Bim in response to IL-2. Immunol 168: 5024-5031. Alcendor RR, Gao S, Zhai P, Zablocki D, Holle E, et al. (2007) Sirt1 regulates aging and resistance to oxidative stress in the heart. Circ Res 100: 1512-1521. Hasegawa H, Wakino S, Yoshioka K, Tatematsu S, Hara Y, et al. (2008) Sirt1 protects against oxidative stress-induced renal tubular cell apoptosis by the bidirectional regulation of catalase expression. Biochem Biophys Res Commun 372: 51-56. Pisoschi AM, Pop A (2015) The role of antioxidants in the chemistry of oxidative stress A review. Eur J Med Chem 97: 55-74. Venkatesan B, Mahimainathan L, Das F, Ghosh-Choudhury N, Ghosh-Choudhury G (2007) Down regulation of catalase by reactive oxygen species via PI3 Kinase/Akt signaling in mesangial cells. J Cell Physiol 211: 457-467. Giordano FJ (2005) Oxygen, oxidative stress, hypoxia, and heart failure. J Clin Investig 115: 500-508. Kops GJ, Dansen TB, Polderman PE, Saarloos I, Wirtz KW, et al. (2002) Fork head transcription factor FOXO3a protects quiescent cells from oxidative stress. Nature 419: 316-321. Sengupta A, Molkentin JD, Paik JH, DePinho RA, Yutzey KE (2011) FoxO transcription factors promote cardiomyocyte survival upon induction of oxidative stress. J Biol Chem 286: 7468-7478. Sedding DG (2008) FoxO transcription factors in oxidative stress response and ageing-a new fork on the way to longevity? Bio Chem 389: 279-283. Forman HJ, Davies KJ, Ursini F (2014) How do nutritional antioxidants really work: Nucleophilic tone and para-hormesis versus free radical scavenging in vivo. Free Radic Biol Med 66: 24-35. Silva MR, Trujillo X, Hernandez BT, Pastor ES, Urzua Z, et al. Effect of chronic administration of forskolin on glycemia and oxidative stress in rats with and without experimental diabetes. Int J Med Sci 11: 448-452. Hayashida N, Chihara S, Tayama E, Takaseya T, Enomoto N, et al. (2001) Antiinflammatory effects of colforsindaropate hydrochloride, a novel water-soluble forskolin derivative. Ann Thorac Surg 71: 1931–1938. Wadley AJ, Veldhuijzen JJ, Aldred S (2013) The interactions of oxidative stress and inflammation with vascular dysfunction in ageing: the vascular health triad. Age 35: 705-718.